Buddhist and Hindi art are filled with countless poses, most commonly, incorporating the fingers, palms, and wrists of each hand, independently, flexing and curling, connecting and extending, to create a vast catalogue of symbolic gestures known as the mudras. In the spiritual practice of Buddhism and Hinduism, the mudras are used to focus a person’s energy and to evoke or symbolize a particular state of mind. They are used throughout eastern art, identifying the Buddhas and other deities, and help to tell a story representative of their lives. In practice, the mudras are used in religious ceremonies, in some forms of Asian martial arts and in various types of Indian classical dance, and as one of the sevenfold aspects of yoga outlined in the Gheranda Samhita and in the Hatha Yoga Pradipika. The mudras used in each practice are not necessarily homogeneous, each catalogue has expanded and evolved over centuries of the tradition and have adapted to fulfill the needs of each custom. It is believed, by some, that the use of the mudras, in conjunction with meditation and breath, aid in healing and promote balance in life, connecting the spirit with the body, earth, and beyond. The mudras became representative of particular conditions and as belief in Buddha and other deities spread, they began to be characterized by the mudras that represented their integrity. 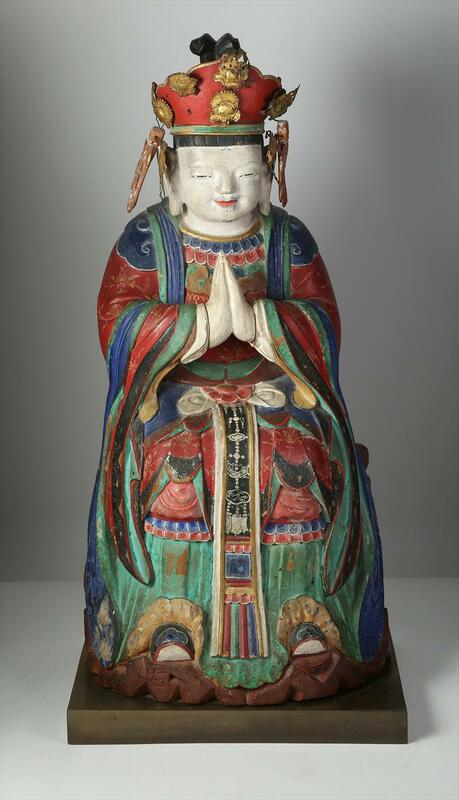 Buddhas and other eastern deities are predominantly depicted with associated mudras. These gestures help to identify the deity and provide a visualization of an immortal’s intent. There are five quintessential mudras associated with the most prevalent depictions of Buddha and his disciples. The Dharmachakra mudra, or the “wheel of dharma” represents the moment in the Buddha’s life when he made his first sermon after attaining enlightenment. 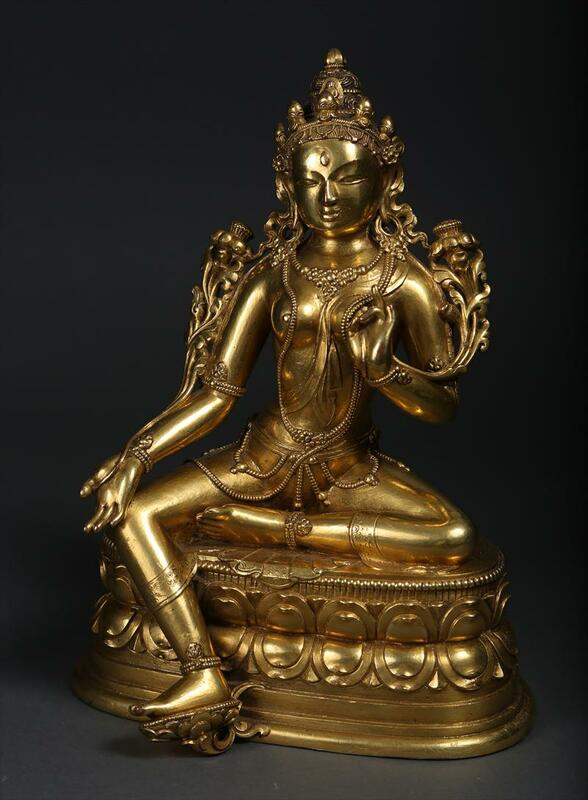 It is symbolically used to identify teachers as can be seen here in the gilt-bronze figure of Tsongkhapa a 14th century Lama and renowned teacher of Tibetan Buddhism. The gesture is formed with both hands, shaped identically with thumb and forefinger creating a circle or “wheel”, positioned at the chest with the right hand against the body palm outward and the left overlapping with palm inwards. It is said to have been used by Vairochana to transform ignorance to reality. The Bhumisparsha mudra symbolizes the Buddha’s moment of enlightenment. This mudra incorporates both hands: while seated in meditation, the left hand rests, palm upwards and fingers extended, in the lap, the right forearm rests across the lap with the hand draped over the knee, palm inward and fingers extending down towards the ground. 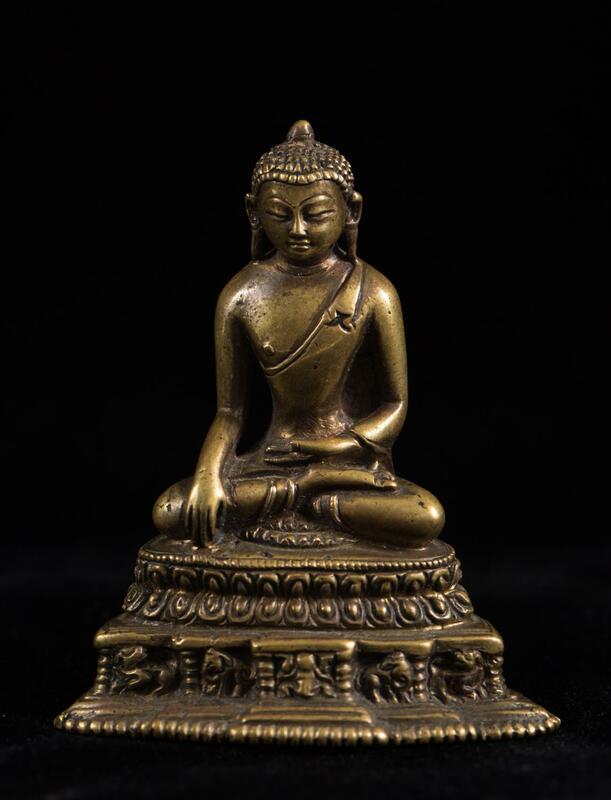 Here the Bhumisparsa Mudra is demonstrated by the Buddha Akshobhya in a 17th Century bronze, and is believed to have been used by Akshobhya to transition his rage into reflection. The Dhyana mudra is the meditation mudra, both hands resting palms upward in the lap, with the right hand over top the left. It was purportedly used by Amitayus to transition his attachment to discernment. 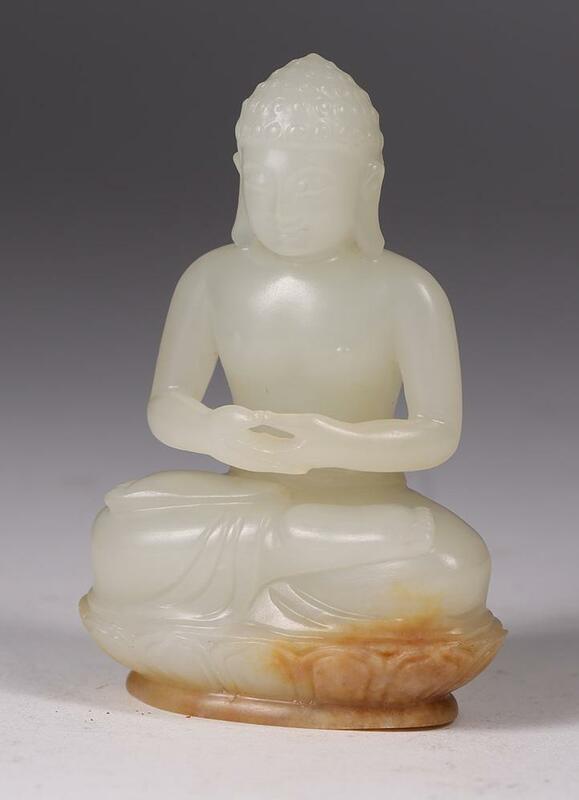 This white and russet jade carving shows Buddha posed with the Dhyana mudra. This pose is associated with Buddha’s moment of enlightenment, that came when meditating beneath the leaves of a Pipal Tree. This mudra has become a common mudra for meditation in the yoga community. The Varada mudra represents the embodiment of generosity, the granting of a boon, and devotion to human salvation. It was used by Ratnasambhava to help transition his pride to sameness. A single hand faces outward with the fingers extended down. It is nearly always used in conjunction with other mudras. Here in this 17th/18th Mongolian figure of Tara, you can see the varada mudra of the proper right hand. The Adhaya mudra is an expression of fearlessness, and good intent. In depictions of Buddha facing an elephant this mudra calms the hostile situation. Implemented to help transform jealousy to accomplishment, the buddha Amoghasiddhi, Lord of Karma, is credited with aiding in this transition. The right hand is raised to shoulder height, with palm facing outward and the fingers pointed upward. 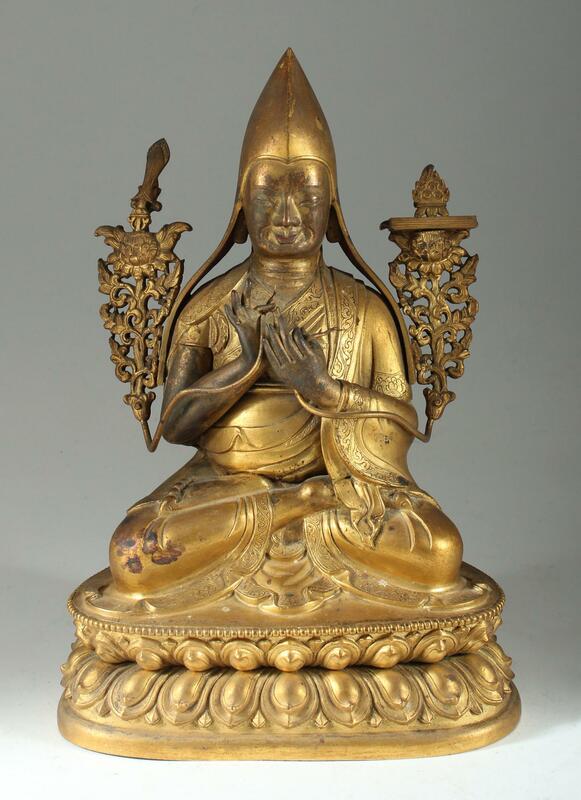 This chinese Gilt Bronze Standing Buddha for the 17th/18th century is a wonderful example of the mudra. Through varying combinations of hand gestures, the mudras embody the feelings, conditions, and characteristics of each of the deities. Rich in symbolic history, each nuance both conforms and projects an understanding of the traditions of the past and the cultural needs of the present. Namaste. "Mudras in Buddhist and Hindu Practices." Scribd. Accessed March 22, 2018. https://www.scribd.com/doc/126066564/Mudras-in-Buddhist-and-Hindu-Practices. Subject: Hand Gestures Main Page (Mudra). Accessed March 22, 2018. https://www.himalayanart.org/search/set.cfm?setID=4933. "Mudras of the Great Buddha Symbolic Gestures and Postures." August 2001. Accessed March 22, 2018. https://web.stanford.edu/class/history11sc/pdfs/mudras.pdf. "Mudras : Buddhist Hand Positions of Buddha." Of Buddha. Accessed March 22, 2018. https://www.burmese-art.com/about-buddha-statues/hand-positions.